- Use a small tuba (F Tuba). - Percussion instruments: Glockenspiel, tubular bells, xylophone, tam-tam, suspended cymbal, tambourine, castanets, wood-block, bass drum. 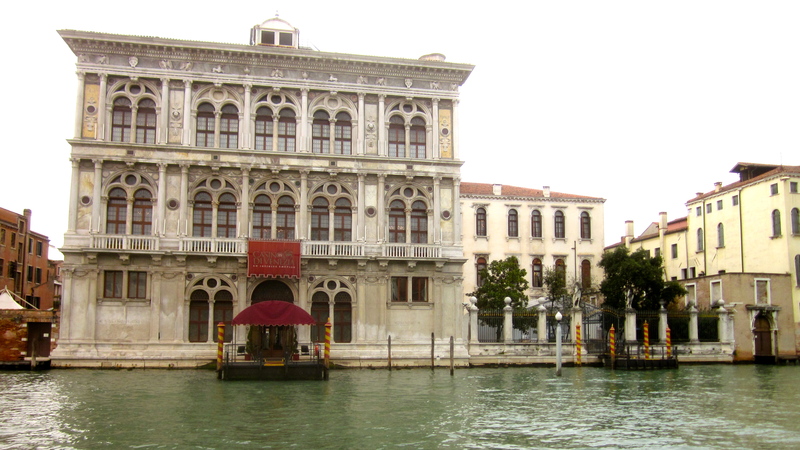 - The organ has to be a quite large and powerful romantic (symphonic) instrument. Without a good pipe organ, it is impossible to perform this piece, since the organ has a soloistic role in the music, representing Pan, the god. - Use an as large as possible string section (preferably 16.14.12.10.8, or more). All double basses should have five strings, or extension. At least two of the basses should have the lowest string tuned in B natural. First performance: 3 September 2015, Royal Albert Hall, London. BBC National Orchestra of Wales, conducted by Thomas Søndergård. Organ: David Goode. About the piece: This piece is inspired by the ancient Greek myths about the god Pan, the god of Nature, of the wild, of shepherds, and of rustic music. He is also known for his sexual powers and for playing the pan pipes. Pan is sometimes depicted as a rather small and not very attractive being, horned and goat-like. On the other hand, he could also be rendered as an imposing, beautiful, and seductive man, albeit with some characteristic features like horns and a tail. Regardless of his appearance, he is to be reckoned as a powerful force of nature. The word ‘panic’ (Panikon) was used by the ancient Greeks to describe the feeling of fear that was incited in men and animals alike when they sensed that Pan was nearby. …..The organ is used as an element in the orchestration and it becomes gigantic pan pipes, representing the god Pan. It makes itself heard from the very beginning of the piece in an extremely loud, dominant and menacing way, playing a four-note chord representing Pan (C-E-F sharp-B), which permeates the whole piece in various guises. The loud organ is a manifestation of the immense power that the god possesses, and at the same time the panic that he stirs up around himself. …..After a few seconds the music shifts into a quiet but wild chase, leading to a sensual duet between a solo flute in the orchestra and the organ. The music intensifies and soon the wild chase returns, this time loudly and exuberantly. A passionate climax takes us back to the intimate duet between the flute and the organ, followed by a tender solo for the piccolo. The organ plays the chords of the introduction again, this time extremely softly, like an echo. The ensuing music, fast and hectic, begins very quietly and grows gradually into a tumultuous bacchanal. which is brought to a conclusion by a renewed and brutal display of the powers of Pan. …..Despite these rather illustrative musical characters, the music is by no means program me music in the sense that it tells a story. I have been influenced by several different representations of Pan, including old Graeco-Roman pictures and statues, the paintings of Nicolas Poussin (1594–1665) and also more contemporary art, such as the images of the Italian painter Roberto Ferri (born 1978). - Only one set of four timpani is required. Player I plays the two smaller drums, and player II plays the two lower ones. - The tubular bells are played by the 2nd timpani player. If possible with extended range down to low A-flat below middle C.
- Preferably a traditional seating of the string section, with separated violin sections (first violins on the left hand side and second violins on the right hand side). Half of the doublebass section should have five strings, or an extension to low D.
First performance: 16 January 2014, Umeå Concert Hall. The orchestra of Norrlandsoperan, conducted by Rumon Gamba. …..This little excerpt is from a remarkably long article which was published in New York only one day after Wagners death. (Here is a link to the article.) This urge to write so quickly and so extensively about a German composer dying on the other side of the Atlantic ocean tells a lot about Wagners importance at the time. 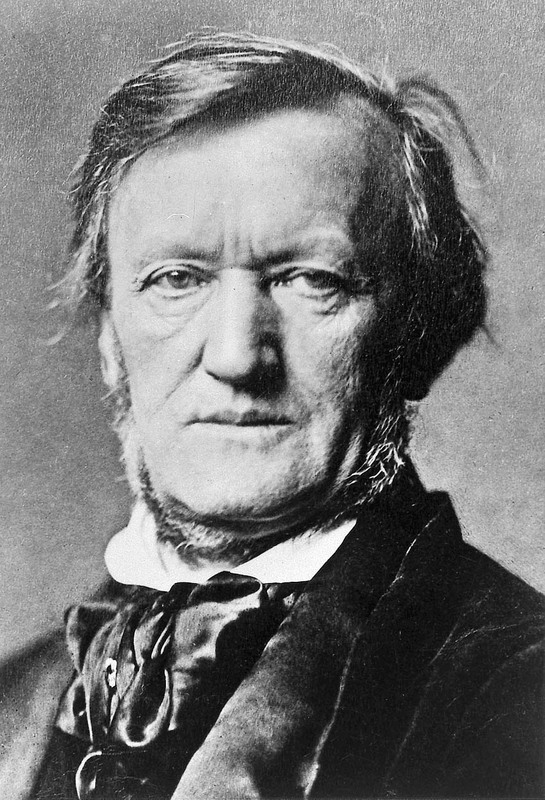 …..The oeuvre of Richard Wagner (born in Leipzig, Germany, 22 May 1813) has always been controversial in many ways, but it is easy to get under the spell of his music, which I did already at age 12. My fascination with his operas has persisted over the years. This orchestral work, a dirge for Wagner (200 years after his birth and 130 years after his death), is a tribute to what his music means to me. 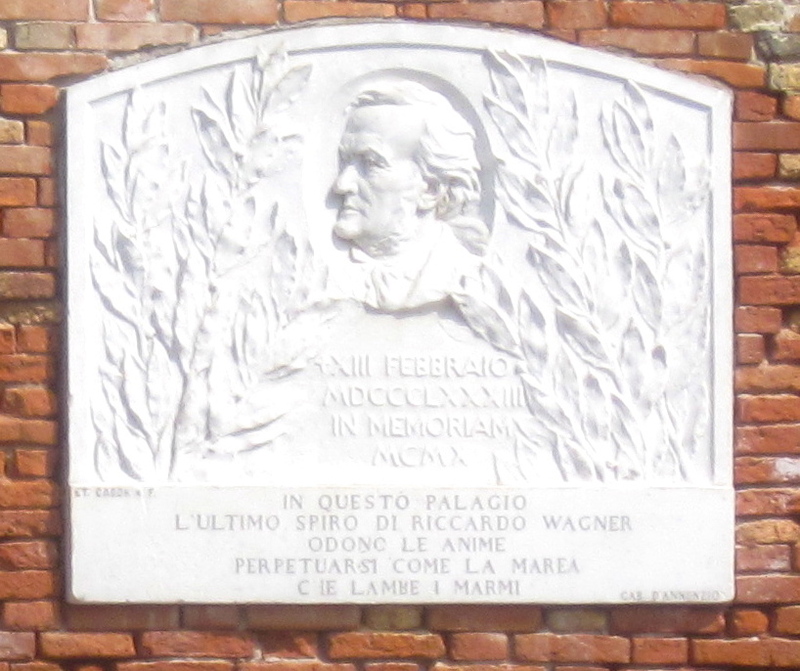 In Death in Venice echoes of some typical Wagnerian musical gestures can be heard, as well as the “fate-motive” from Der Ring des Nibelungen, to symbolize the sudden and unexpected demise of the master, whose influence seems to linger on even today. First performance: 31 July 2011, Styrsö Church, at the island of Styrsö, in the Gothenburg archipelago. Styrsö Chamber Soloists, conducted by B. Tommy Andersson. See Opera & Dance for more details! - Percussion instruments: Glockenspiel, chimes (tubular bells), xylophone, 2 wood-blocks (different pitches), large sizzle cymbal (suspended), small cymbal (suspended), large tam-tam, tenor drum (without snares) or tom-tom, bass drum. About the piece: The title is borrowed from the painting The Garden of Earthly Delights by the dutch artist Hieronymus Bosch (c. 1450—1516), which is housed in the Prado Museum in Madrid. xxxIt is a very large triptych oil painting on wood (220 x 389 cm), very much like an altar screen, and it is considered to be one of the most important symbolic paintings in history. 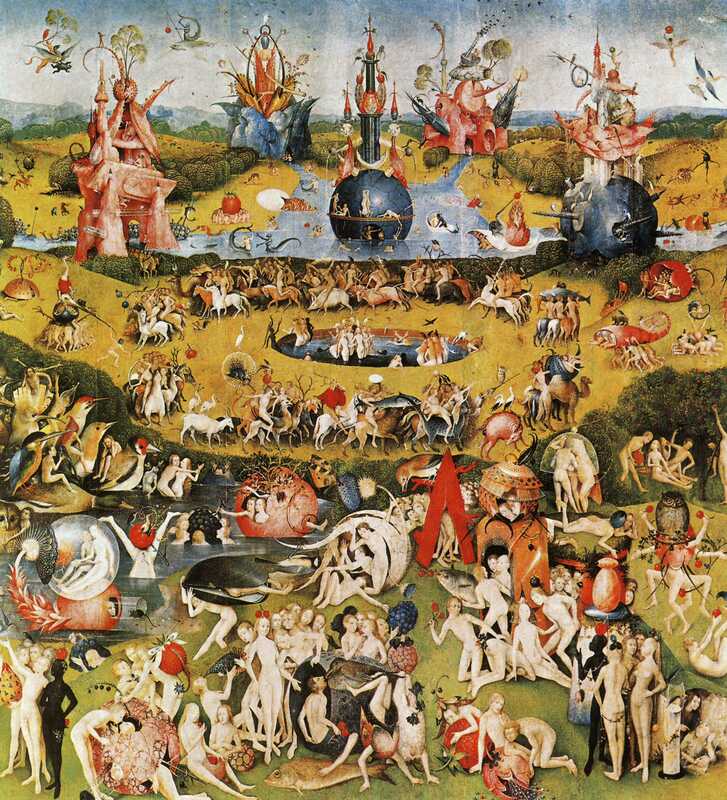 The left-hand panel describes The Garden of Eden, the central panel The Garden of Earthly Delights, and the right-hand panel The Hell, sometimes referred to as ‘The Musical Hell’, because of all musical intruments shown. 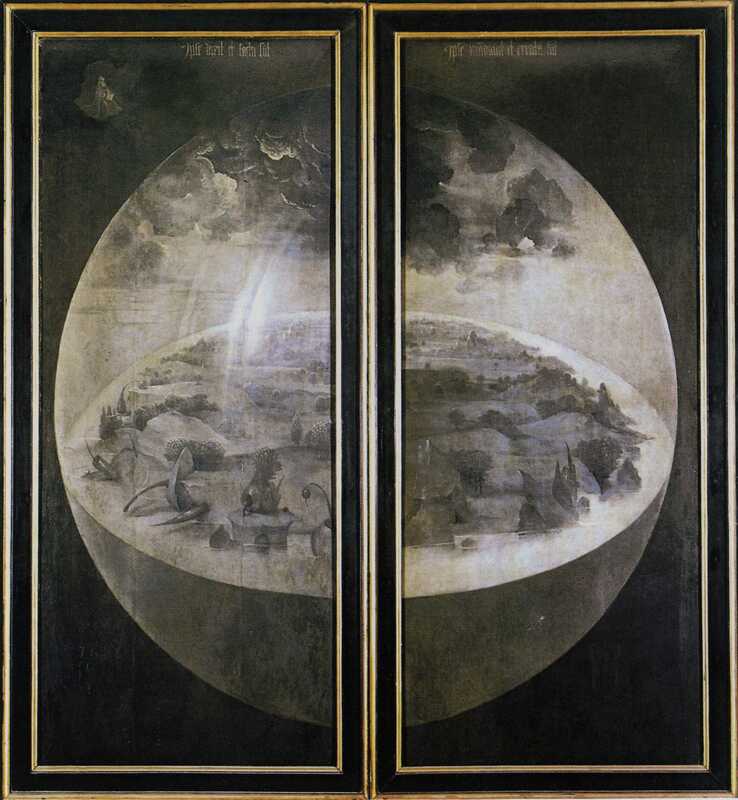 Furthermore, the outer flaps display The Creation of the World. xxxAs I saw the painting in real life for the first time in 2002, I was completely overwhelmed, and immediately realised that it was excellent inspiration for a piece of music. Seven years later, I finally used the source of inspiration for this orchestral work. However, I did not endeavour to recreate the painting in music, I merely tried to capture some of the stir and motion, contrasted with the passion and serenity, which is to be found in this magnificent triptych. - Percussion instruments: Perc. I: large tam-tam, 4 congas, Glockenspiel; Perc. II: large bass drum, 2 bongos, tubular bells, xylophone; Perc. III: tenor drum, large suspended cymbal, small suspended cymbal, vibraphone, maracas; Perc. IV: medium tam-tam, 4 tom-toms, marimba, crotales. About the piece: Passacaglia is based on the famous Passacaglia in C minor by Johann Sebastian Bach, one of my favourite pieces for organ. xxxWhen I started the work (on my own initiative), in 1988, my intention was rather to orchestrate Bach’s Passacaglia for a modern symphony orchestra. But as the work progressed, I realized that it was turning out to become something else. The orchestration became gradually more experimental and I started to add new parts to Bach’s music, to build up tone clusters, to use complex mixture combinations, and to use lots of percussion, in a way that radically changed the music. xxxMy ambitions with the piece grew and the hard work with all the details of the orchestration was so time-consuming, that I could not find the time to finish the piece, since I received commissions for other pieces that I had to write. The score ended up in a drawer, until the summer of 2008, when I completed the piece. - Percussion instruments: triangle, clashed cymbals, suspended cymbal, side drum, bass drum, xylophone, Glockenspiel, tam-tam. 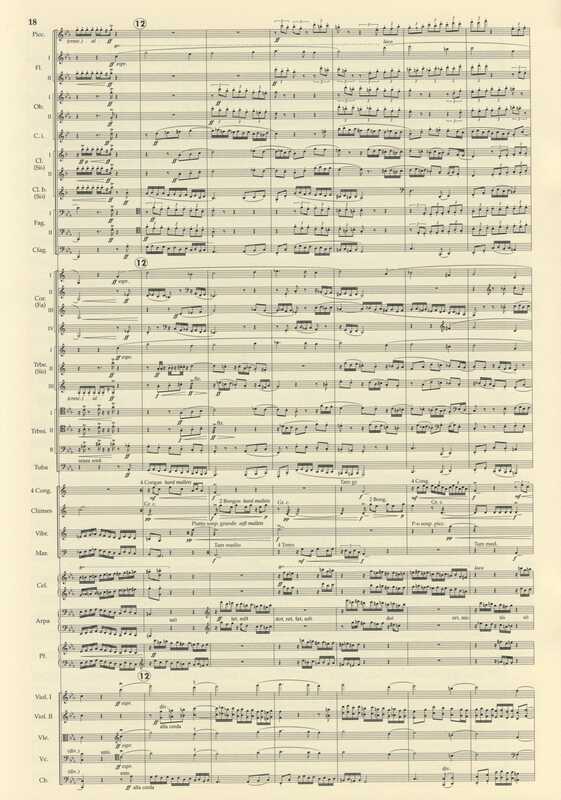 - The orchestration is made in such a way, that this piece can be played by either a large orchestra or a chamber orchestra, without any alterations in the orchestral parts. - If there are only two horns, they play Corno I and Corno II; if there are four horns, Corno III and Corno IV simply follow the indications about where to double Corno I and Corno II. - The piece can be played with or without the three trombones and with or without the tuba; it can even be played with one trombone only — in that case Trombone III should be played. - If no harp is available, the harp part can be played on a piano, except for the harp harmonics (measures 123—129, 289—291 and 297—299), which should be left out. If not even a piano is available, the harp solo in measures 117—121 should be played by Glockenspiel (cued in the timpani part); the rest of the harp part is simply omitted. - The timpani and percussion parts can be played by anything between one and four players (see measures 277—280). Try to play as much as possible of the entries, always giving priority to the timpani part. Some entries might have to be left out, if there is only one player. If there are two players, one of them plays the timpani part (doubling xylophone and Glockenspiel in measures 250—288), and the second player plays the remaining entries. With a clever trap set, nothing should have to be left out. About the piece: Bohèmiana could be described as a tone poem (or an overture), based entirely on themes from Giacomo Puccini’s La Bohème. - The string section should be as large as possible, preferably 16.14.12.10.8 (or even 18.16.14.12.10). - Percussion instruments: bass drum, large tam-tam, small splash cymbal (suspended), triangle, Thai-gong in low B natural, bell in B natural (a brass bell — ship’s bell, watch bell — to be played with metal hammer or other hard beater; could, if necessary, be replaced by a ‘Platten-Glocke’; should sound in the written octave — b1), tubular bells, Glockenspiel, crotales, marimba (range: A—c4), xylophone, tambourine (small size), log drum (2 different low pitches), 2 piccolo wood-blocks (with different pitches), castanets (preferably Spanish castanets, with deep tone). - A large romantic pipe organ is preferable. If a digital organ has to be used as substitute, it has to be a larger model with 16ft-stops in the manuals and 32ft-stops in the pedal. About the piece: This piece is inspired by the novel Satyricon by Gaius Petronius, a Roman writer who died 66 A.D. and the main characters are three young men, Encolpius, Ascyltos and Giton. The rather indelicate story consists of several amusing, passionate and odd episodes involving them and people they meet. xxxHowever, this orchestral piece is not meant to be ’program music’ in the sense that it would try to tell the story. It is merely a concert piece in the spirit of Petronius’ novel. The subheading Choreographic Poem has a particular reason. 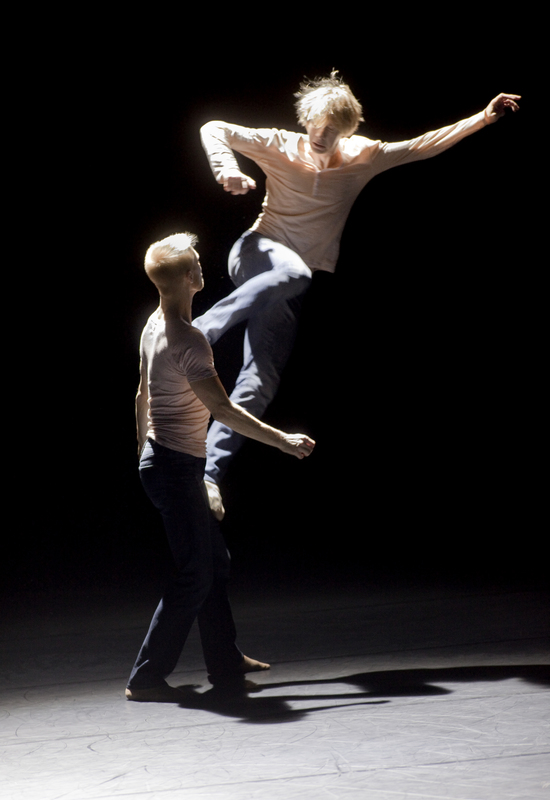 During the composition process I often had the feeling that the music would be suitable for choreography and I decided to dedicate the piece to the memory of my friend Per Jonsson (1956—98), who was a succesful dancer and choreographer. xxxThe music is written in one movement, but it consists of four parts. The introduction is slow and poetic and it gradually becomes more passionate. It is followed by tumultuous and energetic music, based on an obsessive repetition of a few rhythmical figures and chords ending in a bombastic culmination. In contrast the third section is very quiet and sorrowful and becomes like the eye of a storm. It is interrupted by the final part, which is like a grotesque dance, wild and noisy, ending ecstatically gay. I also make use of a slightly modified version of an authentic melody from the ancient Greek-Roman period; Song of Seikolos from about 200—100 B.C. xxxThe colourful and extroverted nature of the piece, together with the huge orchestral forces involved, makes Satyricon suitable for combination with the large orchestral pieces from the late 19th and the early 20th century. About the piece: Epitaffio is an orchestration for string orchestra of Notturno per violoncello ed organo (26 July 1989). The photo is from the first performance of Epitaffio, 7 April 1990. - Percussion instruments: Perc. I: timpani, suspended cymbal, Glockenspiel; Perc. II: large bass drum, large tam-tam (same as Perc. III), tubular bells; Perc. III: side drum, large tam-tam (same as Perc. II), 2 wood-blocks, glockenspiel. NB: two Glockenspiels are needed! Recording: Nosag CD 085 (released 2003). Swedish Wind Ensemble, B. Tommy Andersson (cond.). 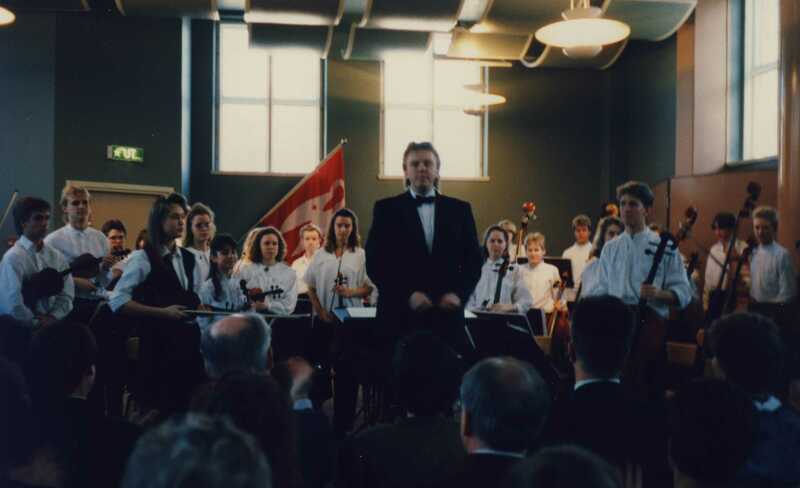 About the piece: Intrada was commissioned by the Borås Music School for a concert that opened their new locales on April 7, 1990, and was conducted by the composer, who himself grew up in Borås. The title associates to the powerful and noble, almost processional character of the work, which is meant to serve as the start of a concert. It is based on the melody that is played daily on the carillon in the tower of the Borås City Hall. This melody is Stadens rytm (The rhythm of the Town) by Viktor Emanuel Lundqvist, and is based on a melody from the Kind region. This melody permeates the music. - Percussion instruments: triangle, tambourine, suspended cymbal, clashed cymbals, maracas, wood-block, claves. - The recorders (1 alto, 1 tenor, 1 bass recorder) could, if necessary, be replaced by cues in the woodwind section. They appear only in the third movement. - The trombones are silent in the third movement. - All celesta-entries could, if necessary, be played on the piano (one octave higher). - Percussion instruments: Perc. I: small wood-block, suspended cymbal, clashed cymbals, small tam-tam, 2 tom-toms, side drum; Perc. II: triangle, 2 Chinese wood-blocks, large tam-tam, bass drum; Perc. III: tambourine, medium tam-tam, xylophone, vibraphone, Glockenspiel. About the piece: This symphony is composed in a free twelve-tone technique. The first movement is slow and quiet (Lento); the second movement is a wild ’scherzo’ in 3/8 time; and the last movement is another slow movement, featuring three recorders. The composer was inspired to use recorders after having seen a television documentary on Japanese ‘Shakuhachi’ flutes. The culmination of the last movement (measures 44—55) consists of a chorale, which was written ‘Arne Ask in memoriam’. Mr Ask was B. Tommy Andersson’s elderly teacher of harmony and counterpoint, who died during the summer of 1982, when the music was written. - Percussion instruments: triangle, tam-tam, cymbals, bass drum, side drum, Glockenspiel. About the piece: Trolle-Ljungby horn och pipa was the first orchestral piece of B. Tommy Andersson that was played in public, when he was 15 years old. This symphonic poem was inspired by a legend from Skåne in southern Sweden, which the composer got to know through one of his school teachers at Särlaskolan in Borås, Einar Svefors. 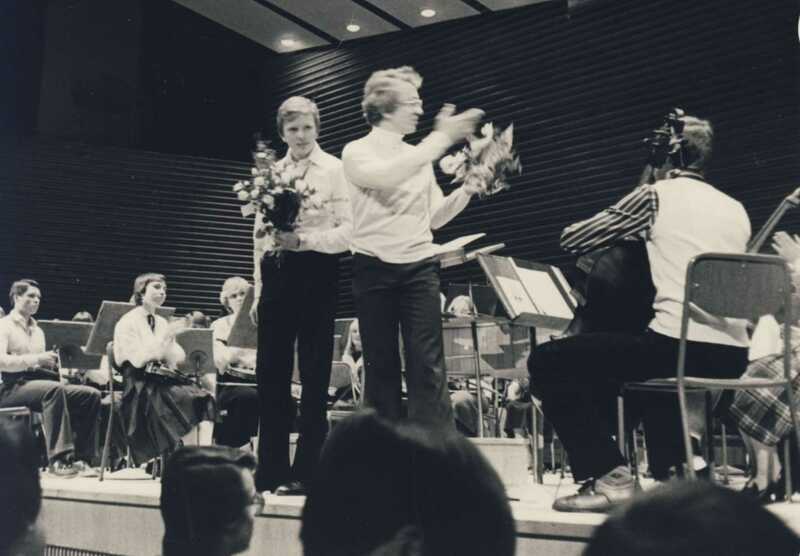 The photo is from the first performance of Trolle-Ljungby Horn och pipa, 11 March 1980. - Percussion instruments: cymbals, bass drum, side drum. 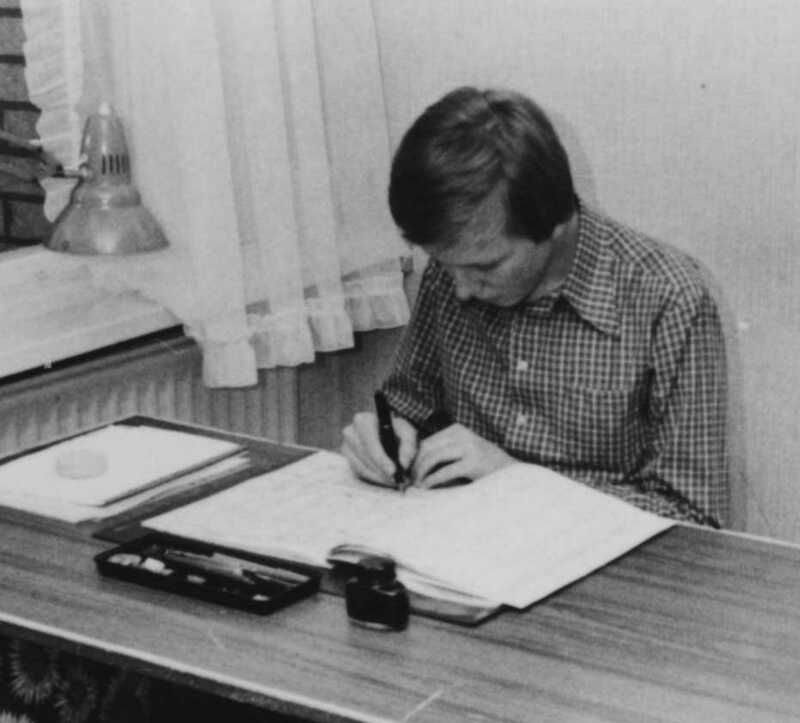 The photo shows the composer at work with the Fantasia for large orchestra.